These words were first attributed to Walter E. Washington, mayor of Washington D.C. in 1971 and I agree with his sentiments completely. I’ve told you before that I find The Art of Letter Writing to be a complete treat because it speaks to the physical, social, intellectual and spiritual aspects of our lives simultaneously. I’ve shared some of the physical aspects of letter writing with you already, but now let’s begin discussing its social aspect. 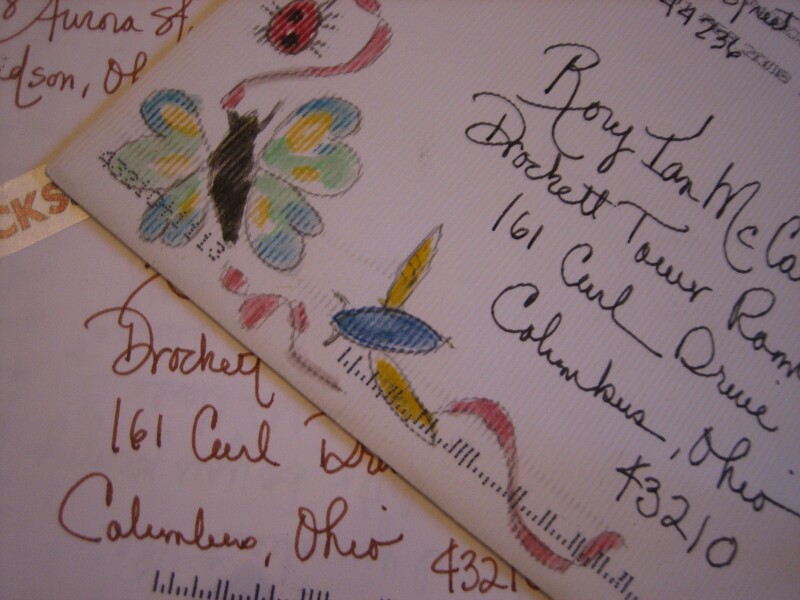 If you are already a letter writer you know the important role people play in correspondence. Without people you’d be journaling not letter writing. 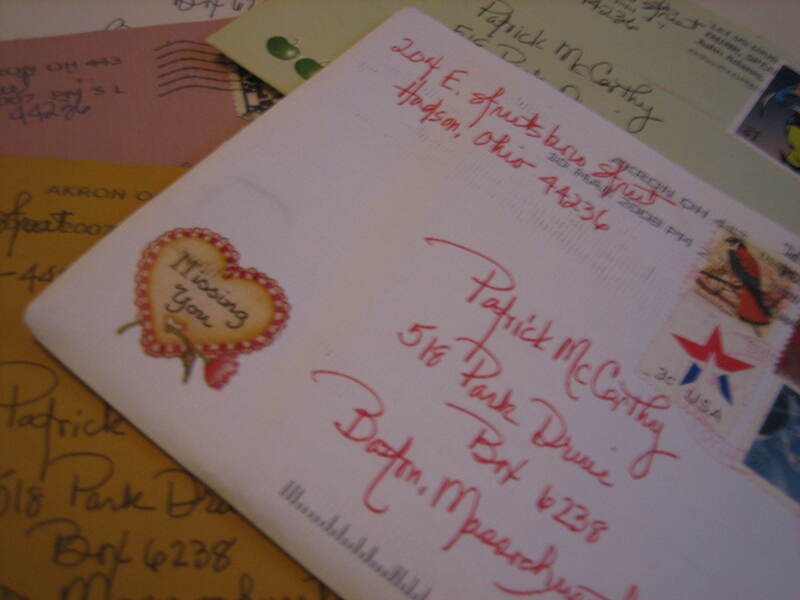 But if you’re just thinking about getting into letter writing you might be wondering to whom you should write. The answer is simple. You can write to anyone and everyone, really, but today let’s start with the obvious, that is, your family and friends. Letters to certain of these people could actually change your life. That’s what happened for me. I might not be married today if I hadn’t been a letter writer years ago writing to family and friends, especially one particular friend named Bill. Allow me to share my story. I met Bill in Boston and really liked him, hoping our friendship would blossom into something more, but I had a teaching job in Cleveland. Bill did not have much hope for any long-distance romance, even ours, but then he didn’t know who he was dealing with – a letter writer! I left Bill in Boston and went off to my teaching job in Cleveland, but I wrote him every day – and not one letter, but two ! I would send one letter to his office and another would be waiting for him at his apartment at the end of his day. He couldn’t forget me if he TRIED! Of course we planned regular visits to each other too , every other week we’d fly back and forth, but without those frequent letters the visits might have stopped. Letters, especially love letters, are unusual these days and they were equally unusual back then. This is part of the reason why they had such an impact. Prince Rainier of Monoco would agree, for he began his courtship with Grace Kelly by letter. Letters worked for him as they worked for me. 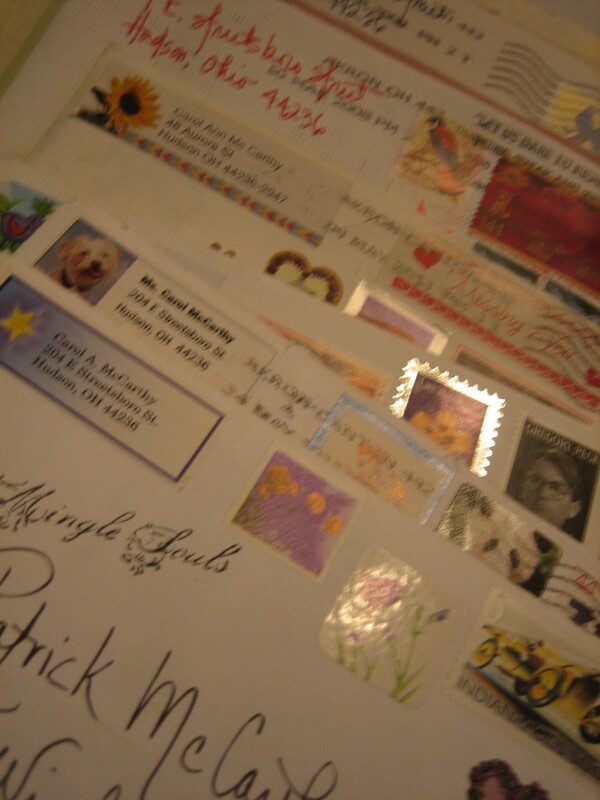 Only 150 letters plus 6 in-person visits and Bill and I were engaged to be married. 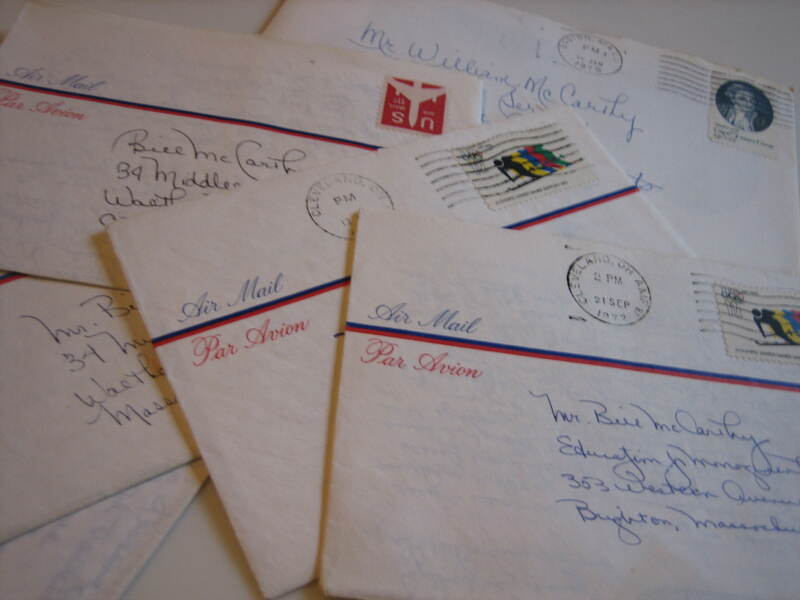 Bill wrote letters to me during our courtship, too, some on handsome monogrammed stationery, no less! He wrote other letters using silly cards. I loved and kept all his letters and he kept mine. All these years later Bill and I are still together and we have all those old, wonderful letters to reread whenever we need a little romantic boost. So you see why I say letters can change your life. They really can! Besides writing Bill, I wrote a lot of letters to my parents when I first moved away from home. My mom would write back to me too, and she included recipes in her letters for I was learning to cook in those days. Thank goodness for those recipes, or I might not have saved any of mom’s letters. We so often don’t appreciate everything and everyone until we lose them. 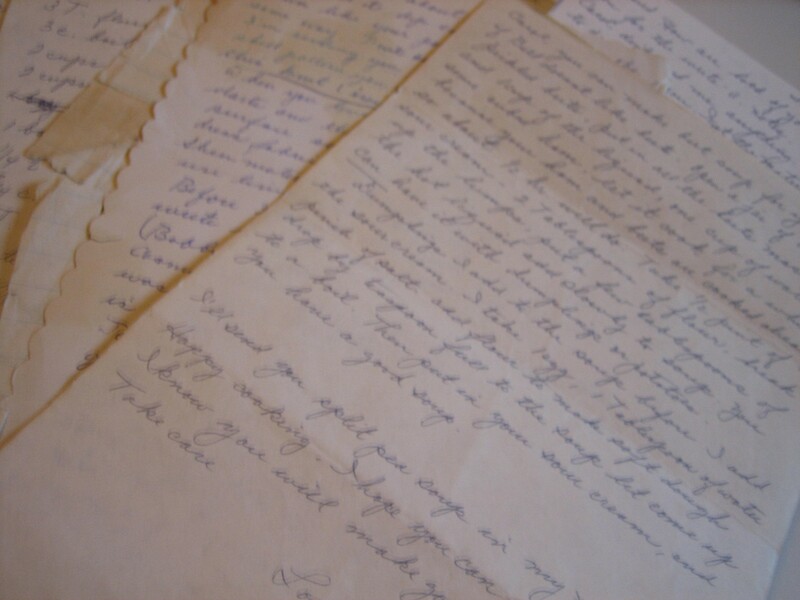 Both my parents are gone now, but I can pick up mom’s letters, letters written in her very own handwriting (so precious! ), and as I now read what she and my dad were doing it’s easy to imagine my parents are still with me. 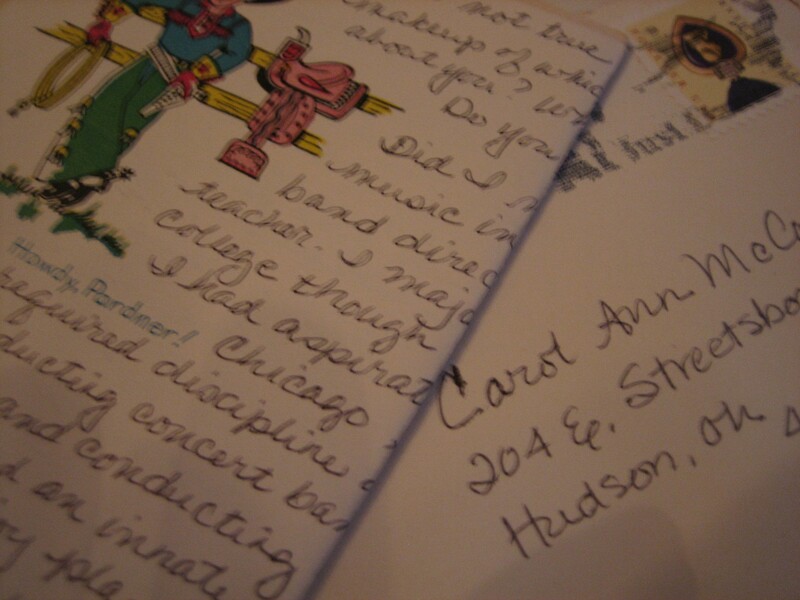 George Sand said it is extraordinary how music sends one back into memories of the past and it’s the same with letters. Save your letters. Unlike a lot of material things, letters become more precious with the passage of time. Fast forward to our sons going off to college. That’s an emotional time for most parents and for some young people too. Letters can really help with separation anxiety. Being an avid letter writer by that point in my life, I used letter writing as a most helpful therapy. Perhaps I was an itty bit excessive, but I wrote my sons a letter every day the first year they were away, and my pen friend Markel’s mother did the same thing! By our son’s second year of college I was much more adjusted so I wrote them only every other day. Their third year?… You guessed it, a letter arrived in their mail box every third day, and by their fourth year away, well, I had to continue what I had started, didn’t I? Now that I’m quite accustomed to their absence, I write them like a “normal” person, every fifth day. I have to chuckle though when I hear people say that they send their college-age kids a card at Valentine’s Day or some other specific time. They ask me if I ever thought of doing such a thing and I say, “Why yes, the idea had crossed my mind… about a million times!“. Did our sons write back to me? No. Did they read my letters? I think they read most of them eventually. Did they find the gift cards I included in those letters? Of course. But, regardless of their lack of enthusiasm, did I enjoy writing to them? You bet! And I think in years to come my sons just may appreciate my letters more, as I now appreciate my mom’s letters. If not them, maybe their wives or children will be delighted to have my letters. 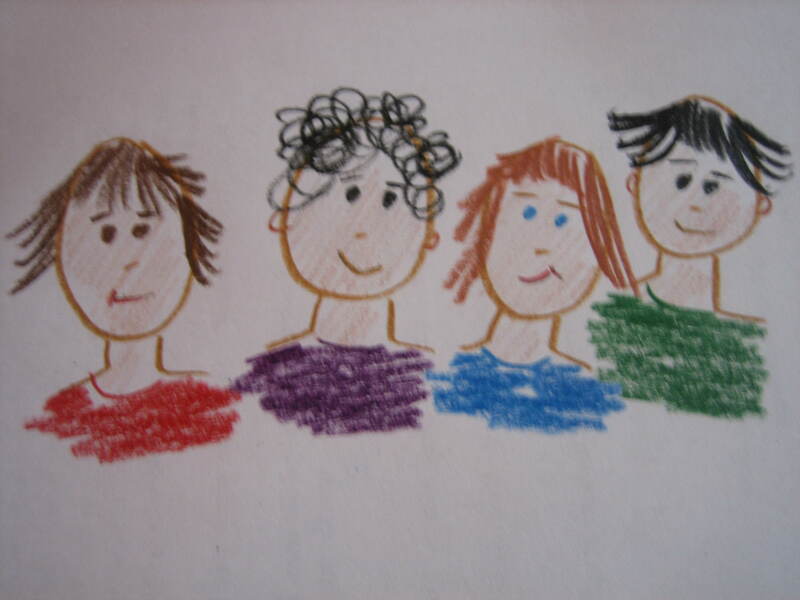 The bottom line is that writing to my sons helped me cope at a time of emotional transition. Writing family is an obvious choice when looking for correspondents, a choice you probably thought of on your own, so go ahead and write those people you already know and love. Corresponding with friends, friends who have moved away, is another obvious choice. I find it most interesting that some of my oldest friends are not those folks who remained living near me, but rather those who moved far away. Because we wrote each other across the miles and over the years we kept in touch and preserved our friendship. Most of my local friends who stayed in the neighborhood and were quite available gradually were taken for granted, and in most cases faded off into social oblivion. I guess there’s truth to the line that absence makes the heart grow fonder… at least if you’re a letter writer. But that doesn’t mean we can’t write to people who live nearby. I now have many pen friends who live across town or even in the same town where I live. Though these locals friends might meet me for coffee, lunch, or afternoon tea we still enjoy writing letters and notes to each other. In some cases we don’t even bother using the postal service to deliver our letters. 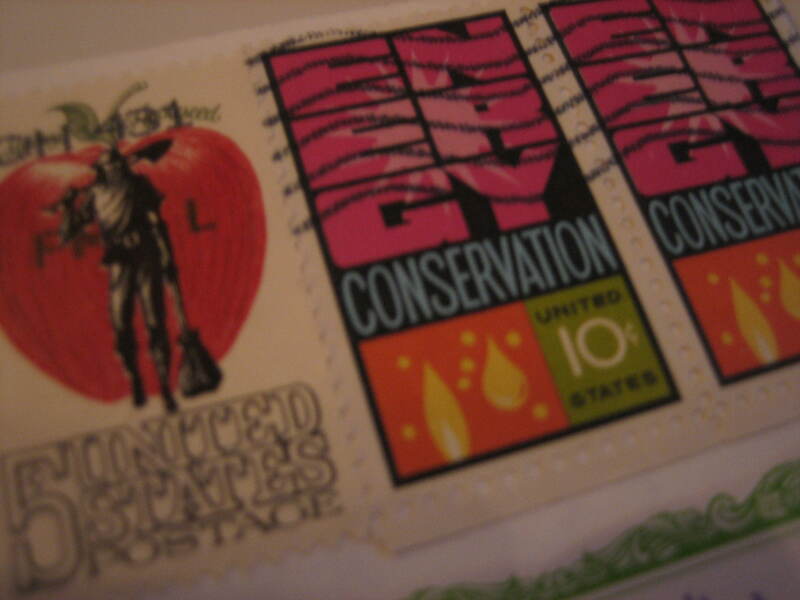 We will draw our own version of a postage stamp on our envelopes and tuck the letters in our friend’s front door. Why not? It’s fun! The telephone is often an interruption, but letters sit quietly until the time is right for them to be read. I’m sure my local friends and I are not the only people who enjoy writing letters to those we are able to visit in person. Henry Miller, the novelist, was quite a scribnomniac. Even when he lived in the same house with Laurence Durell they often exchanged letters. In fact, for most of Henry’s life he wrote dozens of letters a day to people he could have easily engaged in conversation, and did! As it is to all writers, writing was life and breath to him, as it has become to me – maybe with you too. Erica Jong said Henry put out words as a tree put out leaves. Many people put out a great many words by mouth every day. They might find putting those words down on paper to be as pleasurable an experience if not more so. Family, far-away friends, friends who live nearby… these are all people to whom we can write, and in doing so we will enhance our relationships, but there are more – lots more people who are just waiting to hear from us, and I can’t wait to tell you who they are, but that will have to wait till next time. 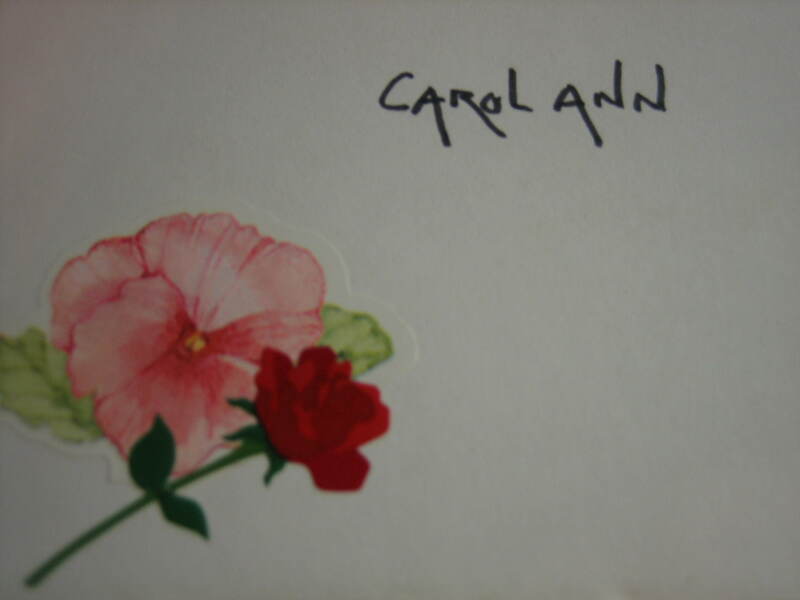 Hi Carol…..saw this quote today by Anaia Nin and thought of you……”We write to taste life twice.” Your card has been in an envelope addressed to you for a month now……hopefully can fill it with words this week….seem to be surrounded with a neighborhood of very I’ll elderly neighbors…and old dogs who refuse to die ….two neighbor dog and Terri…..rough times since returning from Maine and very brief Ohio visit….think hospice is around the corner for mom ……later, Mary. P.S. Fred and I take shifts with Terri as she likes to roam around at night and get tangled up in furniture….coffee table, chairs, etc. ..along with numerous clean ups…..which happen when the owner refuses to train her to get used to a crate ….oh well…one of these days we’ll get some sleep!! Mary, I love the quote you found. It will definitely turn up in one of my next posts. Thanks for sharing. Poor Terri. My Alex has his issues too. And your Mom’s story is sad. so sorry for her and you, but at least Maine was happy. I’ll write soon. Always good to hear from you old friend. Of course happy news is best, but as I always say, sharing doubles the joy but also divides the sorrow. 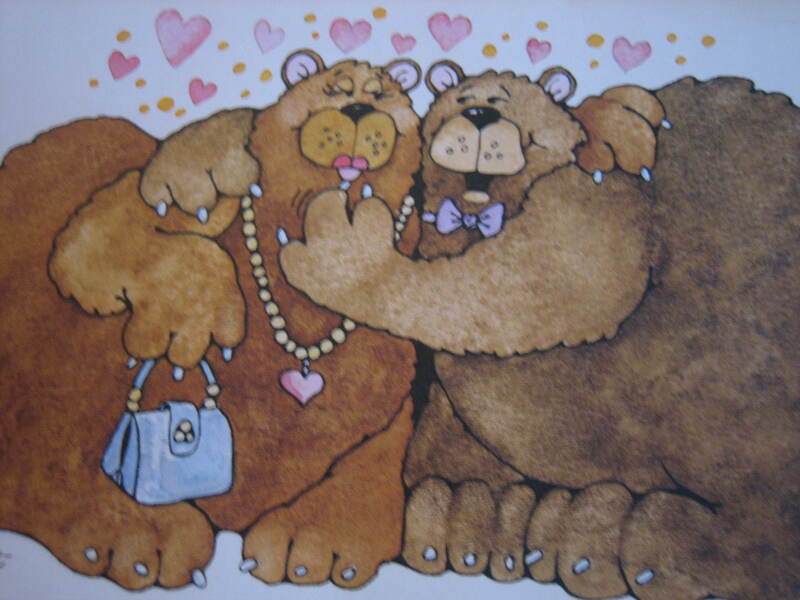 Loved your blog…I found your writing to your husband so very touching and what a treasure you both have in the letters you’ve written to one another and to pass them on to your sons and one day their families…priceless ! Kathy, Happy Autumn to you too. You know, after giving the idea some thought, I realized I write not only to taste life twice, but to keep it forever present.